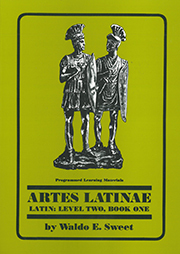 Level 2 Book 1 is part of the Artes Latinae series. Artes Latinae is a programmed, self-teaching Latin course structured to accommodate multiple levels of students, each learning at his or her own pace. These programmed texts are illustrated, straight-forward texts, combined with audio CDs (originally cassettes), are precisely structured to optimize the learning experience. Summary and review sections provide test preparation. Book 1 includes programmed texts and exercises for Units 1-12. Book 2 includes programmed texts and exercises for Units 13-24, click the Related Titles link for information on Book 2.